WASHINGTON — In the final hours of Scott Pruitt’s tenure as administrator, the Environmental Protection Agency moved Friday to effectively grant a loophole that will allow a major increase in the manufacturing of a diesel freight truck that produces as much as 55 times the air pollution as trucks that have modern emissions controls. The move by the EPA came after intense lobbying by a small set of manufacturers that sell glider trucks, which use old engines built before new technologies significantly reduced emissions of particulates and nitrogen oxide that are blamed for asthma, lung cancer and other ailments. It was just as strongly opposed by an unusual alliance of public health groups like the American Lung Association, environmental groups like the Environmental Defense Fund and major industry players like United Parcel Service, the largest truck fleet owner, and Volvo Group, one of the largest truck manufacturers. The shift in agency policy came quietly late Friday, the last day of work for Pruitt, who resigned after several ethics scandals. But agency officials confirmed to The New York Times that, through the end of 2019, the EPA will not enforce an annual cap of 300 gliders per manufacturer that had been imposed in January. The glider truck concept began so the engines of relatively new trucks that had been involved in accidents could be transferred to new truck bodies. But as the emissions control requirements went into effect in recent years, companies like Fitzgerald Glider Kits of Crossville, Tennessee, began to attract thousands of buyers from around the United States — including many small fleet owners — that wanted to evade the new rules, getting trucks they argued were cheaper to run. Fitzgerald made about 3,000 of these trucks in 2017, a production rate that it will now be allowed to return to. An estimated 10,000 glider trucks were sold nationally in 2015 — about 4 percent of new heavy-duty truck sales — and production could soon return to that level. “The Agency is exercising its enforcement discretion in 2018 and 2019,” Molly Block, an agency spokeswoman, said in a statement late Friday, meaning that it is notifying glider manufacturers that even though the limit legally remains in place, the companies can effectively ignore it. The agency, she said, is also considering formally delaying the 300-unit cap until December 2019 — by which point it hopes to have permanently repealed the cap. The rollback was immediately condemned by environmental groups, which have appealed to the White House to block the EPA from creating the loophole. They noted that the effort to reduce air pollution caused by diesel trucks had been embraced by Democratic and Republican administrations for nearly two decades. Vickie Patton, the general counsel at the Environmental Defense Fund, blamed both Pruitt and Andrew Wheeler, the No. 2 official at the EPA who will become its acting administrator. Pruitt had championed the rollback, claiming that the EPA did not have the legal authority to force companies like Fitzgerald to significantly reduce production of glider trucks. But that move came only after Fitzgerald donated tens of thousands of dollars to Rep. Diane Black, R-Tenn., who is a candidate for governor there, and who asked Pruitt to reverse the rule. Pruitt announced his intention to eliminate the 300-unit limit last year, but it was slowed down by the White House. Agency officials said the White House asked the EPA to do a more comprehensive study of the environmental and economic impacts of his proposal — an unusual move during the Trump administration. Executives at Fitzgerald did not respond Friday to a request for comment. 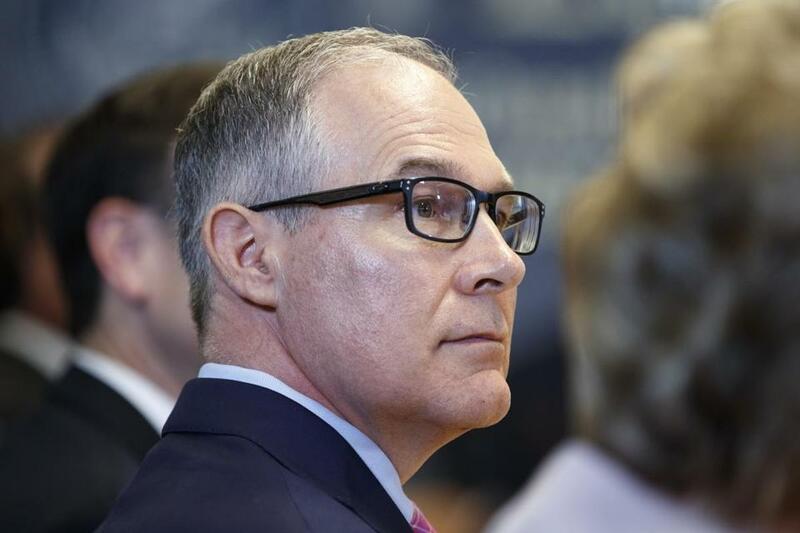 But in an opinion piece written in April, Tommy Fitzgerald Sr., its chief executive, praised Pruitt and blamed industry competitors, like Volvo, that sell new trucks for the now-delayed regulatory effort. Emails released through a Freedom of Information request show that EPA officials had been working with an executive from Volvo Group North America to do tests on glider trucks that would be used to challenge the effort by Pruitt.